AROUND a third of women in East Sussex have missed a life-saving test aimed at reducing their risk of cervical cancer, new figures have shown. In line with falling national trends, three in ten women across East Sussex did not attend their last smear test – which can identify abnormal cells and prevent 75 per cent of cervical cancers. Sussex Public Health team is highlighting the importance of cervical screening. Darrell Gale, Director of Public Health at East Sussex said: “Sadly, in the UK, two women lose their lives to cervical cancer every day, and nine women are diagnosed with the disease. In a bid to highlight the importance of smear tests, the team has arranged a bespoke clinic for women, a number to call for advice and is highlighting extended opening hours at some GP surgeries for women who can’t attend appointments during the day. Specialist Practitioner, Jenny Greenfield, said embarrassment and previous uncomfortable experiences lead to some women ignoring invitations to make cervical screening appointments. “Some women find the test slightly uncomfortable, but those few minutes of discomfort could save your life,” she said. 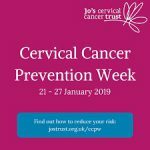 Women aged between 25 and 49 are invited for a cervical screening test every three years and those aged 50 to 64 are invited every five years. Mrs Greenfield added: “it is important to get tested regularly, but if women have left it longer to make an appointment they shouldn’t feel embarrassed to contact their GP surgery. It’s better to have the test late, than not at all. 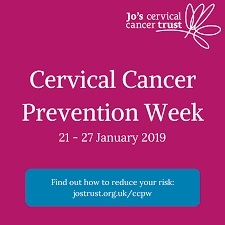 More information about cervical screening tests is available at www.jostrust.org.uk or call Jo’s Trust on 0808 802 8000. Alternatively, residents can contact their local GP practice to book a test. Women can also talk about the test with a specialist practitioner, and get advice and reassurance by Helen Cheney, Health Protection Specialist, on 01273 336864. This entry was posted in Adult Social Care, Public Health on January 16, 2019 by karenb.